Definition: Contentment is the free submission to and delight in God’s wise and fatherly disposal in every condition. A truly contented man, though he is the most contented man in the world, is also the most dissatisfied man in the world; that is, those things that will satisfy the world will not satisfy him. Contentment comes, not by way of addition, but by subtracting from desires, so as to make desires and circumstances even and equal. 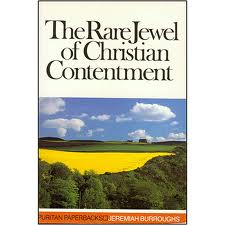 Our contentment does not come by getting the things that we desire, but in God fashioning our spirits to our condition. If God provides someone riches, no matter how great, but also gives him up to the pride of his heart, that person will never be contented. We must have more than the peace of God; we must have the God of peace. It is not life that I must have, but the God of my life. Not riches, but the God of those riches. I must have the cause as well as the effect. When a Christian who has learned contentment has some wealth, he thinks of how he can serve God and do good with it. If God takes the wealth away, he is satisfied enjoying God and serving Him in another way by showing His grace in suffering recognizing he has a much of God as before. God is most honored when you can turn from one condition to another according to how He calls. There is a burden in giving account for prosperous conditions. Those who enjoy great wealth must give a great account to God. Consider your relationship to Jesus. Have you not enough in Him? All the riches in Him are yours. God has put us in the present circumstance. Think about fulfilling His will rather than being discontented about position. There is a heaven within the souls of saints. No soul shall ever come to heaven, but the soul that heaven has come to first. In the midst of our many sins, we hope that God will accept our poor services. Why then, should we not, in the midst of our afflictions, bless God for His many mercies? This entry was posted in Discipleship, Quotes and tagged Burroughs quotes about contentment, contentment in the Christian life, how can I be content, how do I achieve contentment, why am i discontented. Bookmark the permalink. I had thought of contentment as complacency or worst as shrieking the responsibly to recognizing what needs and proactively responding to that need. I was deceived and God used Burroughs to alter my false thinking. I was blessed by Rare Jewel.